I’ve spent the last week putting together a selection of new projects for while I’m recovering from surgery, as planned. 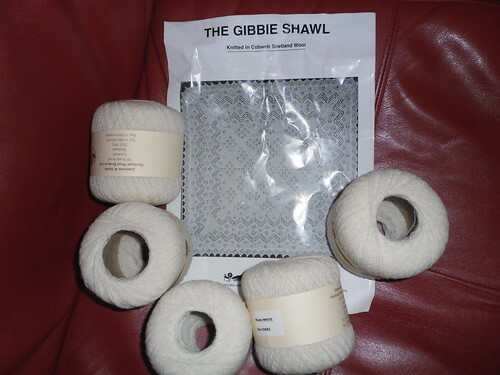 That’s the Gibbie shawl kit from Jamieson and Smith…ordered on Thursday night, delivered on Monday morning. It’s very intricate and large, and has to be done by 18th December for Gethin’s christening. What have I agreed to?! The pattern is Sagrantino Shawl, available free on Ravelry. I’m using up leftover Tofutsies sock yarn. Hopefully there will be enough! The knitted piece here is the Buttercup top I made a while ago, which I hated when I actually wore it. It just didn’t sit right. Plus I lost loads of weight soon after finishing it so it also didn’t fit right. It’s going to be frogged and the yarn re-purposed to make another T-shirt. 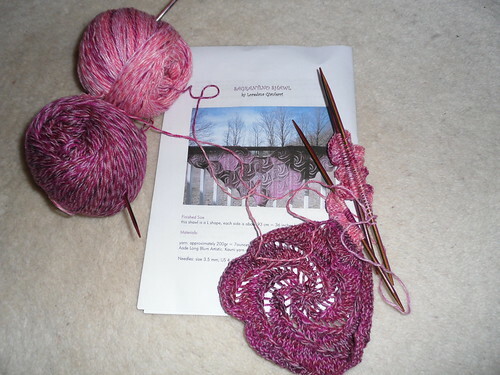 This is a jaunty little cap I’m knitting for the warmth on the regular train station treks. The pattern is called Capitan Hat and is free on Ravelry. I’m using leftover chunky wool I made A’s Smokin cardi with. 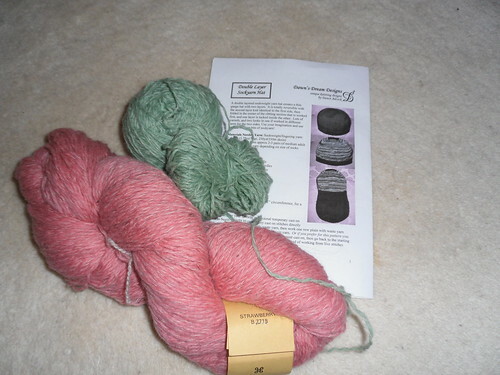 Next up is another scarf/shawl, this one called Pimpelliese. 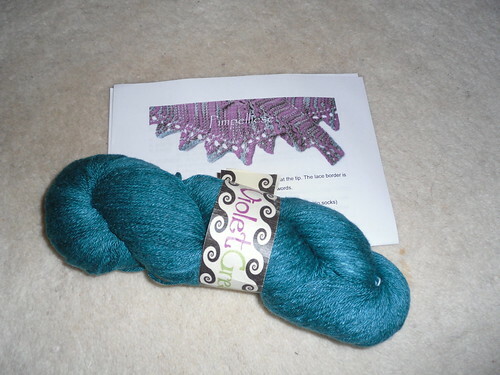 I’m using a really soft Stellar sock yarn from Violet Green. Yet another free pattern from Ravelry, this is a double-layer sockyarn hat. 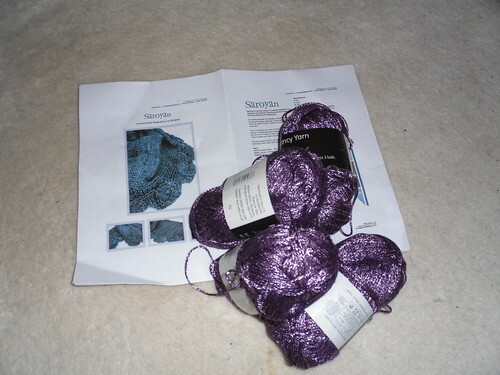 Only I’m not using sockyarn, I’m using some pretty things I bought in Denmark a couple of years ago. On to another scarf, this time a lace one made using laceweight yarn. I haven’t quite decided on a pattern yet, but I’ll be using up at least some of the yarn I bought to make my Mum’s mother’s day shawl. And finally, Saroyan. I’m using some of the pretty shiny acrylic stuff with which I made a scarf for my friend Ali last year. Ali loves the softness of it, and so do I. In addition to all of these lovelies, I’ve also got a bag full of materials ready for making more pocket bunnies, and a sock ready to start. Some of the finished items will be for me, but some will almost certainly be gifts. Who knows how many will turn out as planned…or get done at all! 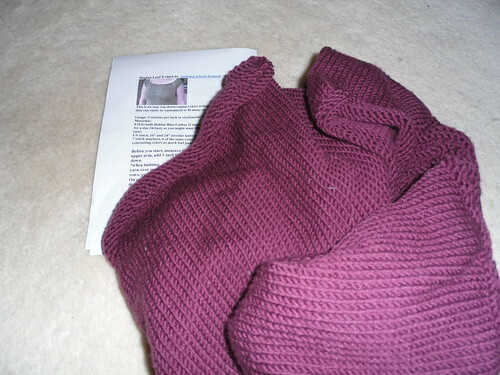 This entry was posted on October 2, 2010 at 10:00 am and is filed under knitting. You can follow any responses to this entry through the RSS 2.0 feed. You can leave a response, or trackback from your own site. 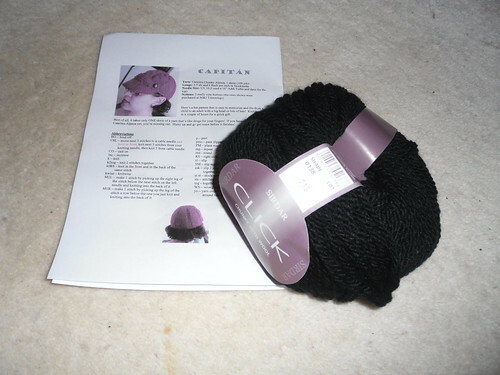 The christening shawl is going to be stunning I can just tell! 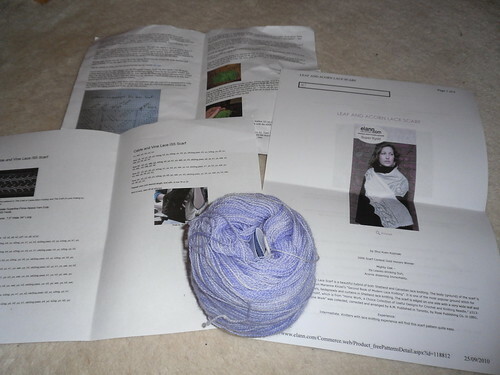 Some lovely looking projects lined up, I hope the knitting fairies are good to you and they go as planned. wow! you’ve got a lot of gorgeousness going on there!!! !